Pink Bee-Wasp Condo AND a small prototype observable bee station for solitary bees and wasps is at the Royal Botanical Gardens’ Nature Centre in Burlington, at the Butterfly Garden in the Arboretum and a location TBA. Ask the Nature Centre for information via http://www.rbg.ca . 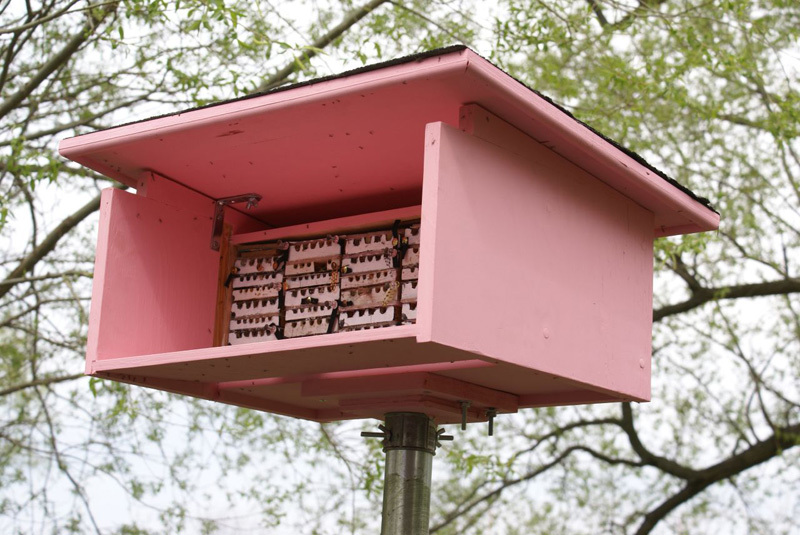 Pink Condo, for solitary, cavity nesting bees and wasps, cross-references with Bumble Domicile (integrated media installation, 2008) and our Bee Trading Cards (2008 – 2009). The ‘condo’ houses many small observable nest blocks which host a diversity of solitaries. More than 10 species of solitary native bees and wasps can be viewed emerging, nest-building, visiting flowering plants and collecting materials at the Royal Botanical Gardens’ Nature Centre and surrounding parkland. Created by independant researcher Peter Hallett (Toronto), it is one of several observation ‘houses’ or ‘boxes’ for solitary pollinators in the region. This installation and boxes like by Professor Hallett can be experienced at RBG, The Toronto Zoo and Wings of Paradise (Cambridge, ON). Inspired by the Hallett design, Audio Bee Booths created by Sarah Peebles allow observers to listen with headphones while watching nesting activities inside the tunnel nests of solitaries up close – in cross-section (sideways). Several are located at various venues in Ontario, and at the Calgary Zoo as of 2013. 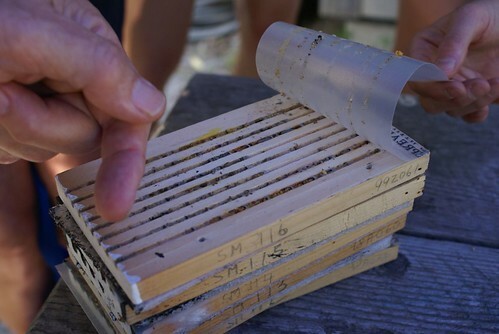 Hallet’s design, an easy DIY and others are posted at Building Houses for Native Bees. ‘Pink Condo’ and other solitary bee ‘house’ designs inform works-in-progress (Amplified Habitat Installations for Wild Bees), whose form and content highlights solitary nesting wild pollinators, their lifecycles, nesting materials, and their temporal relationships with flowering plants. In this video independent researcher Dr. Peter Hallett shows and discusses the observation nest blocks with Sarah Peebles. The observation nest blocks (and their inhabitants), are donated to FCG by Dr. Peter Hallett. Special events and ongoing educational activities will take place through the FCG programmes, among others. Peter Hallett shows some wasps. Photo: Rob Cruickshank More photos from Rob at Flickr (see his tags “bees”, “resonating bodies” and related). Some more nest blocks, photos courtesy of Dr Peter Hallet (click to enlarge), below. 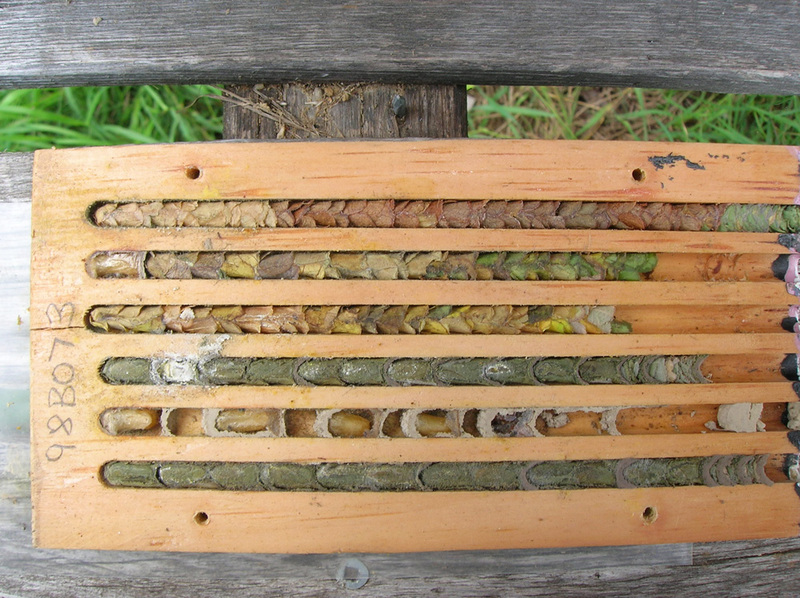 Many of these nests have been created with cuttings of leaves carefully constructed by leafcutter bees (Megachile), other nests were constructed by other species of solitary bees using resins (from plants chewed), mud and other materials. 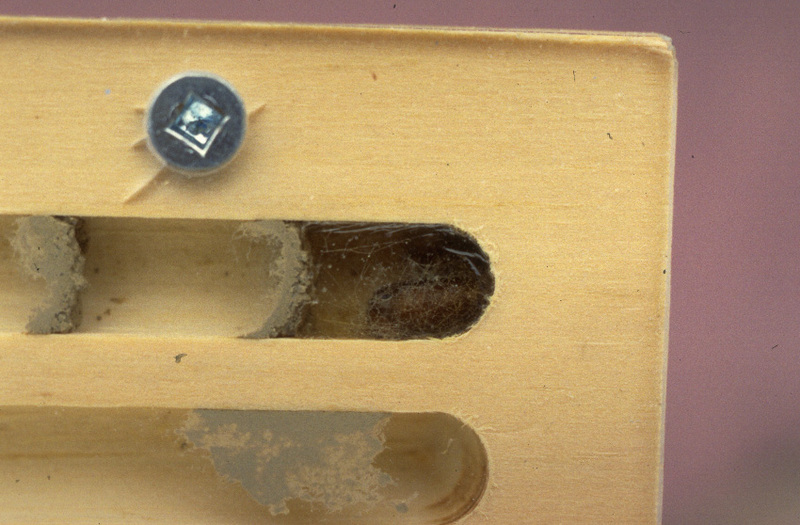 Some pupae are visible. When they reach maturity, they will chew their way out. Some have emerged and others may have been parasitised. If you look carefully, you can see that in some bores there are more than one species of bee and/or wasp. 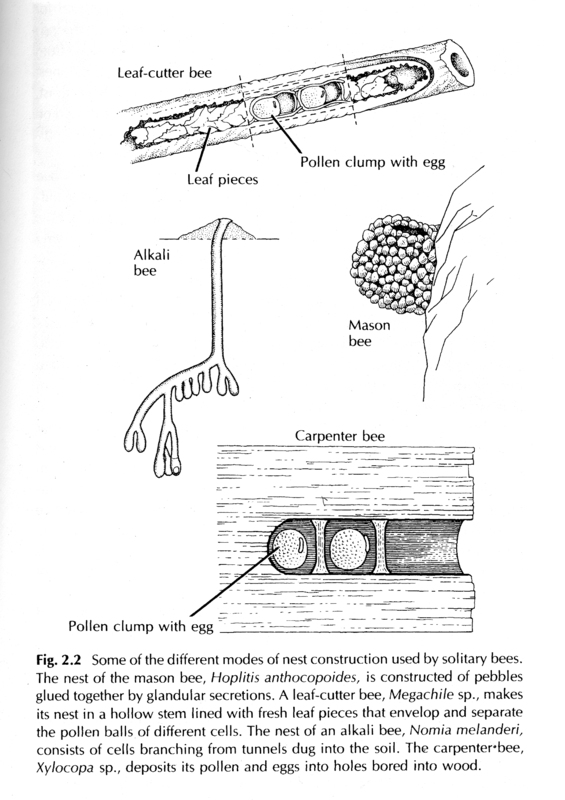 Below, an illustration of the nesting strategies and life cycles of various kinds of solitary bees. at the Bee Trading Card Gallery, A Guide to Toronto’s Pollinators, and resources. What a great site with terrific info. As a gardener, and because of the “bee” in my name, I feel a particular affinity to bees. I’d like to do a post on our Toronto Gardens blog, and link to your site. Are there any talks coming up for 2009 that I could mention? “Resonating Bodies” is not presenting any talks for 2009. 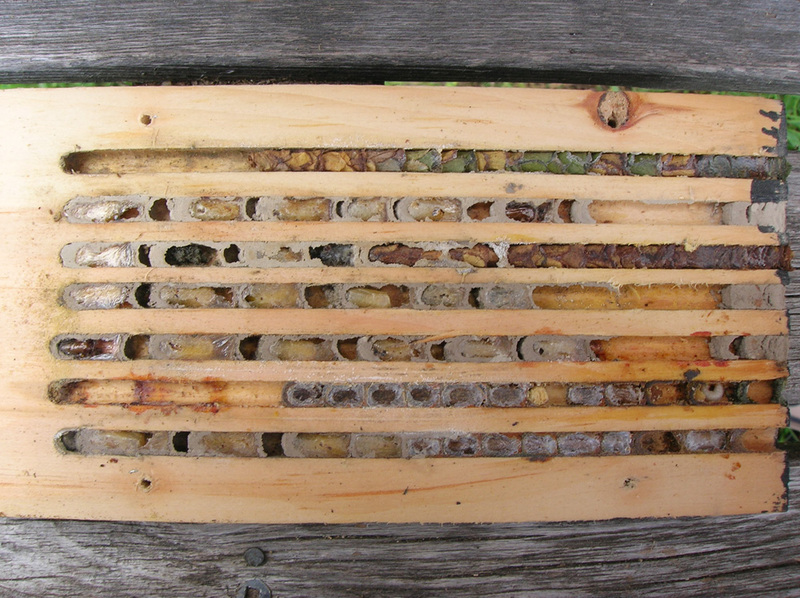 I’m now working on amplification (acoustic and electronic) of solitary nesting bees/wasps for RB part II, next year. (Sarah Peebles). Thanks for posting on T Gardens blog!